A few weeks ago, I received a copy of Horrorstor in the mail from Quirk Books. Since we’re about to enter into October, I thought it would be a fun way to start the month. The premise of the book is intriguing. Orsk, Ikea’s cheaper more American cousin, is a soul-sucking place to work. After being forced to leave college for financial reasons, Amy started to work at Orsk and is constantly feeling pressured from her boss, Basil. She’s pretty sure she’s about to get fired. When Basil asks Amy and another employee in for a meeting, Amy know’s she’s going to be fired. But, instead, Basil says that they need her to work overnight, to discover who is causing terrible damage to the merchandise in the middle of the night. It isn’t going to be an easy night. It’s even more difficult when the damage seems to have a supernatural source. The idea of a ghost story in a big box store is interesting. It was what drew me in when asked if I’d like to review it. The book itself is only about 250 pages and looks just like an Ikea (well, Ikea knock-off) catalogue. The cast of characters is interesting in composition. Amy and Basil have similar backgrounds, but very different reactions to the circumstances they’ve faced. Amy is more determined to trudge along until something better comes up, whereas Basil has made every attempt to excel. They’re joined by Ruth Anne, a 14 year veteran of the Orsk franchises. The side characters feature much less of a role and are much less developed. They largely serve to force Amy to interact with the supernatural. It’s not long into the evening that the crew starts to realize things are not normal. When one of the characters mentions that Orsk is built atop a former prison known for torture and cruel punishments, we know things are about to get hinky. The story is set up to be a horror story with a critique of both working conditions, generally, and the nature of big box stores. Some of this is done much more successfully than others. The most disappointing aspect of the novel is the introduction of the aforementioned prison as a source of evil. While I understand the desire to pinpoint a source of the ghostly activity, a source itself was unnecessary and limited some of the interest in Orsk itself as a haunted place. The main villain was a bit disappointing. His back story didn’t really explain why he was how/who he was and why he’d stick around. Amy and Basil are both in fairly relatable situations. Amy grows from a person who runs away from problems to one who runs back to help. This growth, though, felt a bit strange. We don’t actually see Amy running from much, except responsibility at work. Basil shows much more complexity. He’s set up as the annoying boss who’s drinking the corporate kool-aid. We discover that, in Basil’s case, there’s a clear motivation for his behavior and an internal desire that is more complicated than Amy. This was interesting because Amy is the main character. It was a fun read regardless. There were more than a few gruesome moments and it was action-packed. 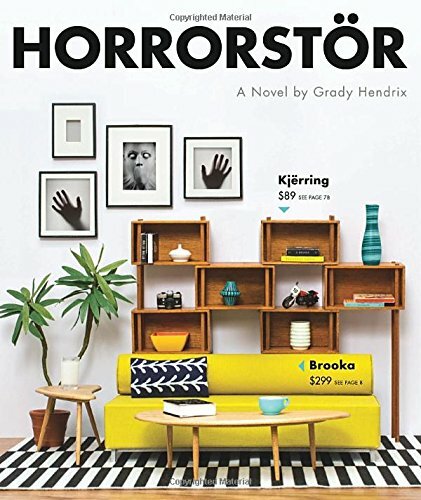 This entry was posted in Reviews and tagged Book Review, Books, fiction, Ghost Story, Grady Hendrix, Horror, Horrorstor, Ikea, Orsk, Quirk Books.